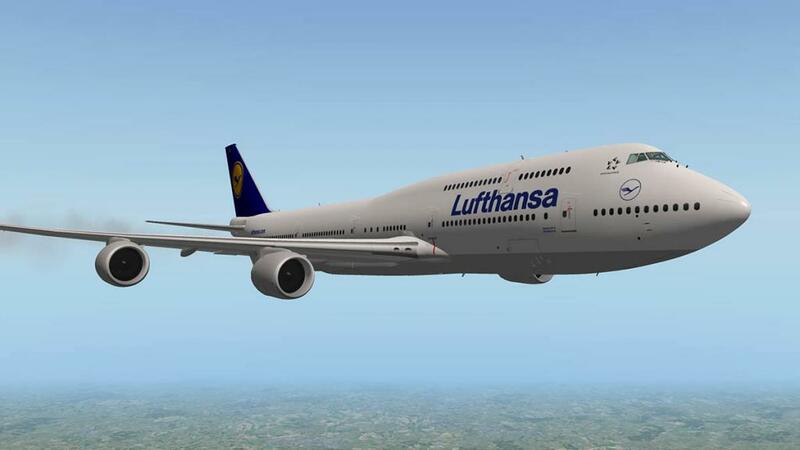 It is hard to believe that the Boeing 747 has been with us for nearly fifty years. First as a concept stage as the CX-Heavy Logistics System (CX-HLS) for the United States Airforce (1963) and then as a full development 747 series in 1965 when Joe Sutter was moved on from the Boeing 737 development team to create the first widebody (Twin-Aisle) aircraft. The 707 series with the Douglas DC-8 changed the world in jet performance. But the 747 changed the world by moving millions of passengers around the world in the next forty years. It set standards in size, performance, reliability and most of all it made airlines and still does billions of dollars in profit. It was a gamechanger. It was a worldchanger and the most iconic aircraft we still use. But even the most brilliant aircraft ever built is starting to feel old. It is trying to survive in a world were airlines survive in the threat of exorbitant jet fuel prices, It was once a huge moneymaker, but the margins have now caught with the "Queen of the Skies" and Qantas is now sending one a month off to the Victorville graveyard. The last stretched version in -400 series is old as it was first put into service in the Northwest Airlines in February 1989. And today most are 20 years past their introduction dates and have only 5-10 years left on their airframes. Boeing knew their greatest achievement would not last forever. So in 2005 they announced the Boeing 748 (747-8) Advanced. The aircraft is a fusion of old and new in the old well proven concepts of the Boeing 747 family and the fusion with the new Boeing 787 (Dreamliner). Boeing want the best of both worlds, in the size, power and abilities of the 747-400 and the new generation (fuel efficent) engines and systems of the B787. It was also needed to compete with the more modern Airbus A380 that would be a threat to Boeing in the VLA (Very Large aircraft) market. In a strange change of context, the VLA market is shrinking in a world of increasing billions of people. Airbus has only sold 259 aircraft and Boeing has only sold 107 747-8's, including 67 of the freighter version, and 40 of the passenger version (i - Intercontinental). Efficient big twins are more fuel efficient and can bypass huge hubs by going directly from one port and directly to the next. However these two aircraft may still have the larger market yet as airport slots become more expensive and airports are still getting larger. 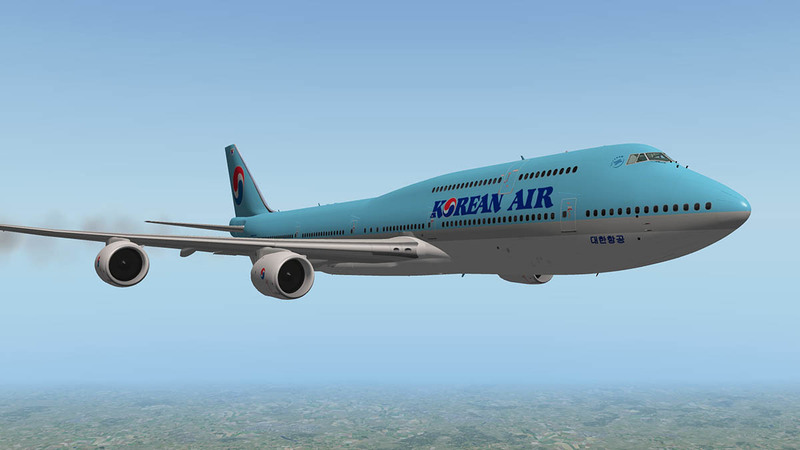 Moving large volumes from Asia to the USA or Europe is also going to need large aircraft. VLA's might not rule as large as they once have, but they are still a required need for airlines. 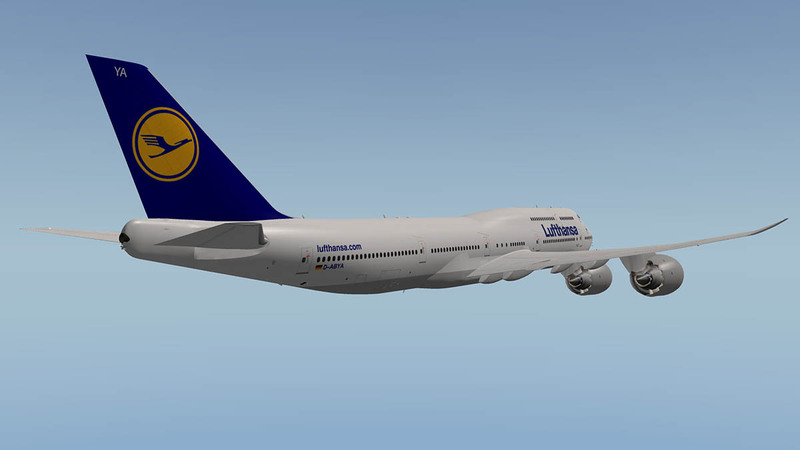 The 747-8 was designed to be the first lengthened 747 to go into production. 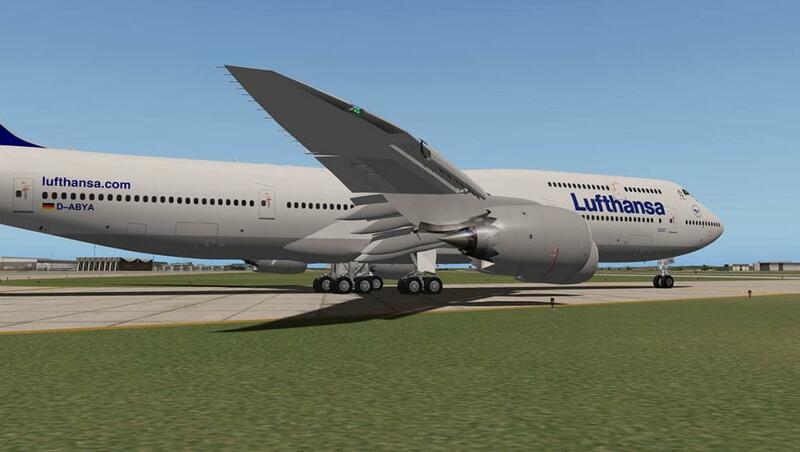 The 747-8 and 747SP are the only 747 variants with a fuselage of modified length. 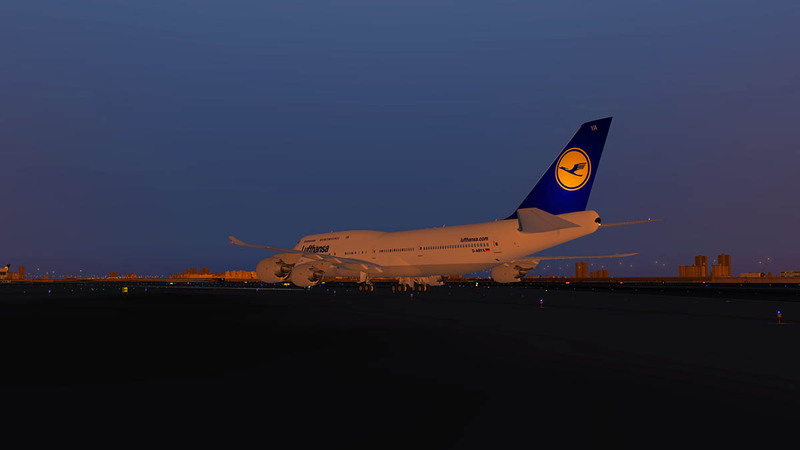 The two 747-8 variants (Freighter and Intercontinental )feature a fuselage stretch of 18.3 ft (5.6 m) over the 747-400, bringing the total length to 250 ft 2 in (76.25 m). The 747-8 is now the world's longest passenger airliner, surpassing the Airbus A340-600 by approximately 3 ft (0.91 m). 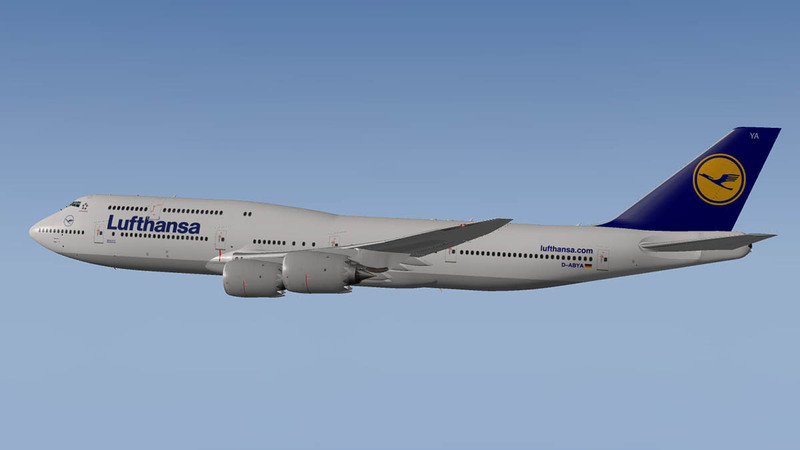 With a maximum take-off weight of 975,000 lb (442,000 kg), the 747-8 is the heaviest aircraft now flying in either commercial or military, manufactured in the United States. The sweep and basic structure has been kept to contain costs, but the wing is thicker and deeper, with the aerodynamics recalculated. The pressure distribution and bending moments are also different, and the new wing for the passenger version holds 64,225 US gal (243,120 L) of jet fuel, and the cargo aircraft 60,925 US gal (230,630 L). 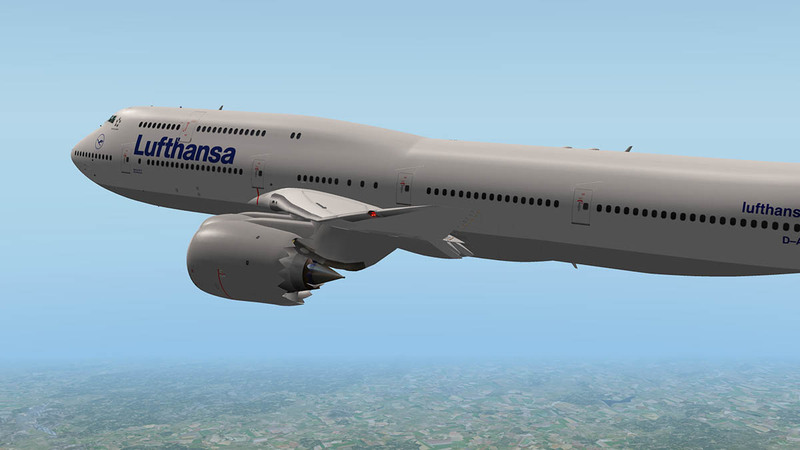 The increased wing span now requires airports in Category F rather than E, making the -8 similar to the Airbus A380. The new wing features single-slotted outboard flaps and double-slotted inboard flaps. 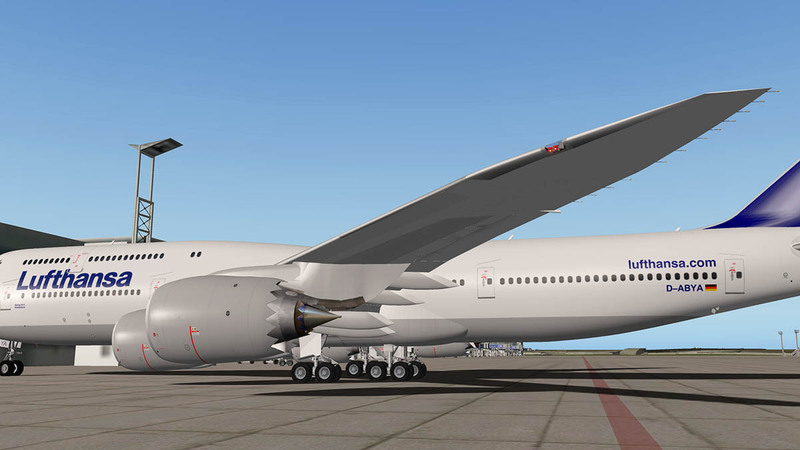 Raked wingtips, which similar to the ones used on the 777-200LR, 777-300ER, and 787 aircraft, are used on the new 747 variant instead of winglets as used on the 747-400. The General Electric GEnx is the only engine available for the 747-8. It is one of the two powerplant choices offered for the Boeing 787. 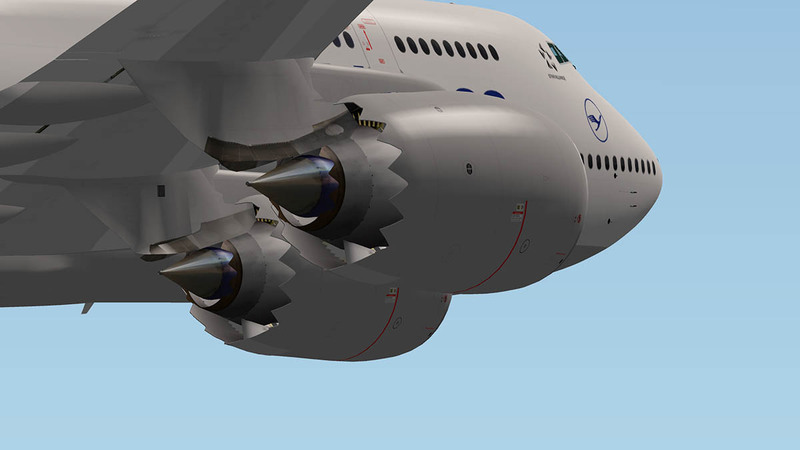 The 747 engine variant has been adapted to provide bleed air for conventional aircraft systems (The Boeing 787 is electric) and feature a smaller diameter fan to fit on the 747 wing. On February 8, 2010, after a 2.5-hour weather delay, the 747-8 Freighter made its maiden flight, taking off from Paine Field, Washington at 12:39 PST. During the flight tests, Boeing discovered a buffet problem with the aircraft, involving turbulence coming off the landing gear doors interfering with the inboard flaps. Boeing undertook an evaluation of the issue, which included devoting the third test aircraft to investigating the problem and the issue was resolved by a design change to the outboard main landing gear doors. Boeing handed over the first 747-8F to Cargolux in Everett, Washington, on October 12, 2011. (After contractual issues). 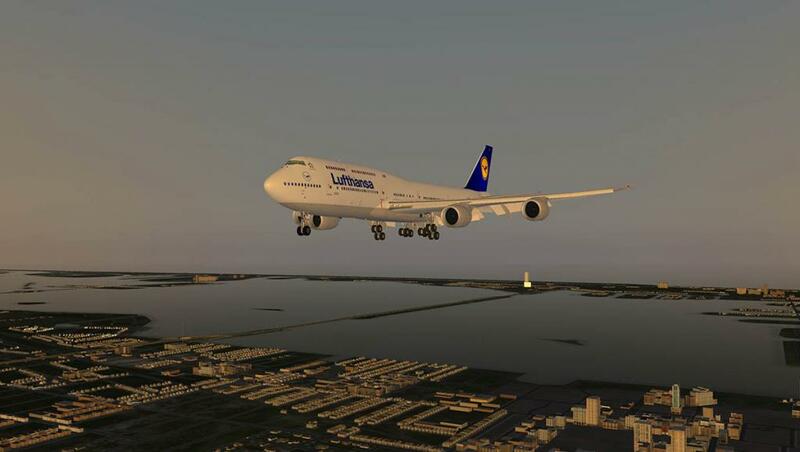 Lufthansa received its first 747-8I on May 5, 2012, and began operating the 747-8I on flights from Frankfurt to Washington, D.C. on June 1, 2012. Modern aircraft with composite structures look very different than aircraft that were made from stringer frames with overlaid aluminum panels that are held together with rivets. These composites are created from long sections of molded panels that give a look of clean clear lines and almost a plastic feel about them as they cover more area with less joins. Smooth and molded to fit it can make an aircraft even the size of the B748i look quite bland compared to the standard design of the former B747 series. 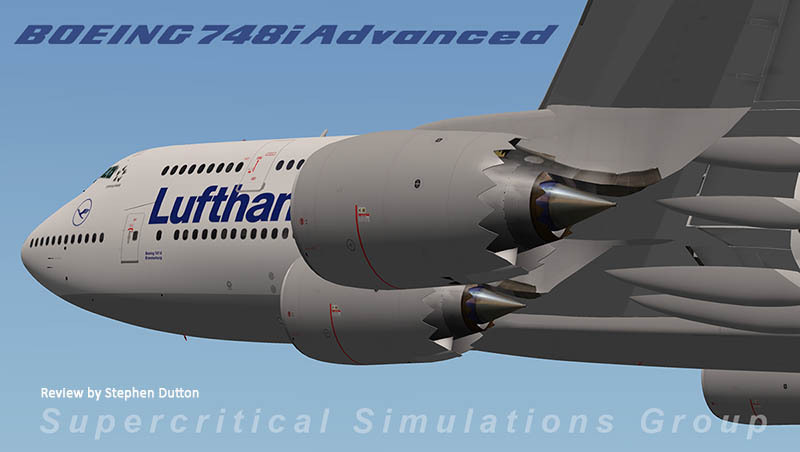 SSG has however created the feel and look of the B747-8 very well, with great detail when you get close. The wings and engines are a highlight of this composite design, and in the way they are very well crafted and designed. 748 has single-slotted outboard flaps and double-slotted inboard flaps rather than the usual triple slotted flaps on the existing 747/744 series, Leading edge flaps are very nicely integrated, so all the flaps look far cleaner in full extended position than your usual 747/744 versions. The wing is the same 37.5 sweep ratio but the wing itself is thicker. The 748 is actually a slower flying aircraft than the B747-400 as economy and not speed is the airlines mantra nowadays. A 1percent decrease in speed not an really important issue to an operator these days over the price of jet fuel. The undercarriage design is excellent as well, but you need to get really close in. All supports and struts are very good but they all bit clean for a working aircraft. Detailing includes even the notes on strut and the wheel rims are a work of art. The centre rear bogies turn as they should. By all accounts this is seriously one large aircraft. The problem is it then relates to the same size in Xplane. The model will still take up the same amount of volume as it does in the real world, but in our case it is in polygons and textures. 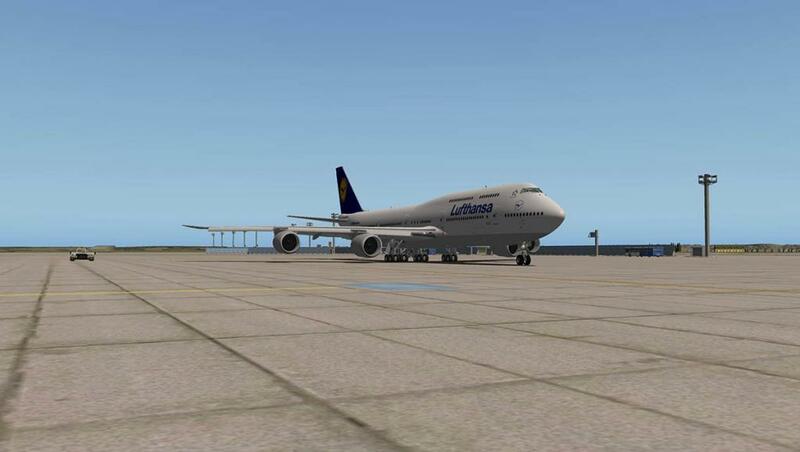 Compare the size of a general aviation aircraft like from Carenado and put it next to the B748i to get the idea. 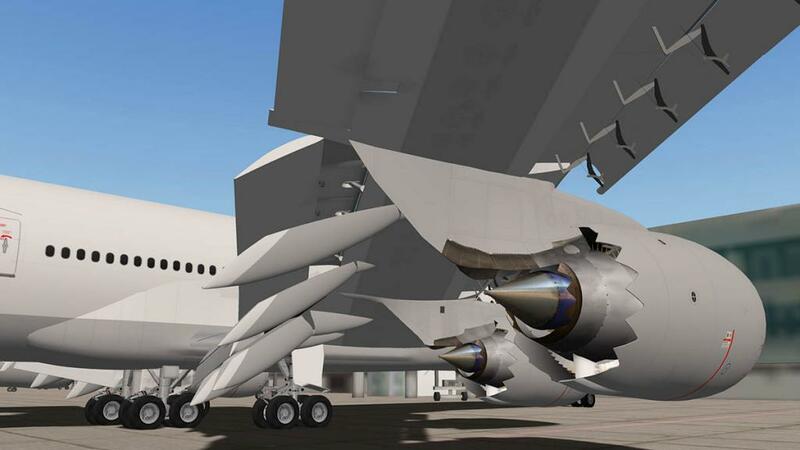 Make the Carenado the same size as the Boeing and you can see the problem in how much Xplane has process in numbers to understand that it is going to use a lot of space to do the same thing. 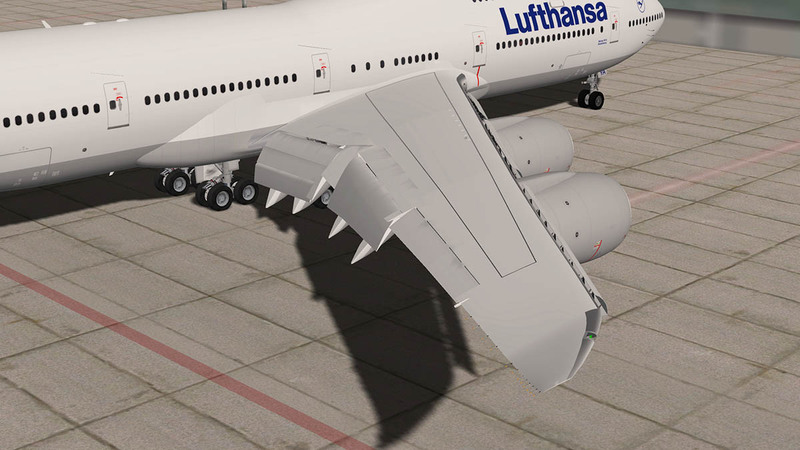 If you fly Peter Hager's A380 you will notice the same problem. In Peter's case he lowered the numbers by compromising on the textures against the high poly count. But it still took up a lot of your frame rate headroom. A big aircraft uses a lot of space and you can't change that fact. The B748 cockpit is a hybrid really. Part Boeing 744-400, part Boeing 777 and a few modern items from the Boeing 787. 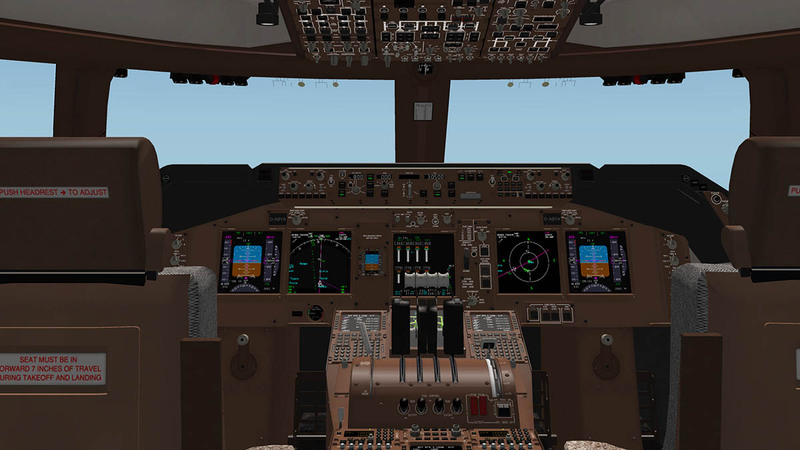 Mostly it is a B744 cockpit and layout, but the idea is that any pilot from the older Boeing 744 and even a Boeing 777 would find the layout familiar. Airlines are big on commonality today and if you are a B744 pilot you should very easily transfer to the B748 without much extra training. That said it is to be noted the engines are very different and have different start up procedures, On the overhead panel it is mostly a clean panel is a correct panel and only show the abnormality of an incorrect or not working item. Which is following the Airbus philosophy in cockpit procedures. The cockpit is 3d and is very good. Textures on the early version were horrible!. The thought of flying ten or more hours looking at them filled me with dread. These are far better, but even better textures are coming in the next upgrade. But these are okay, and I found them quite nice after a while. There isn't the sheer detail and workability of the Boeing 777 but everything here is still nicely covered. Five screens across the forward panel with Two each side (left/right) for the Pilot and Co-Pilot in the MFD (Main Flight Display) and MAP/Navigation screen. Central is the Integrated Standby Flight Display (ISFD) and "Upper Engine Indication and Crew Alerting System" (EICAS). 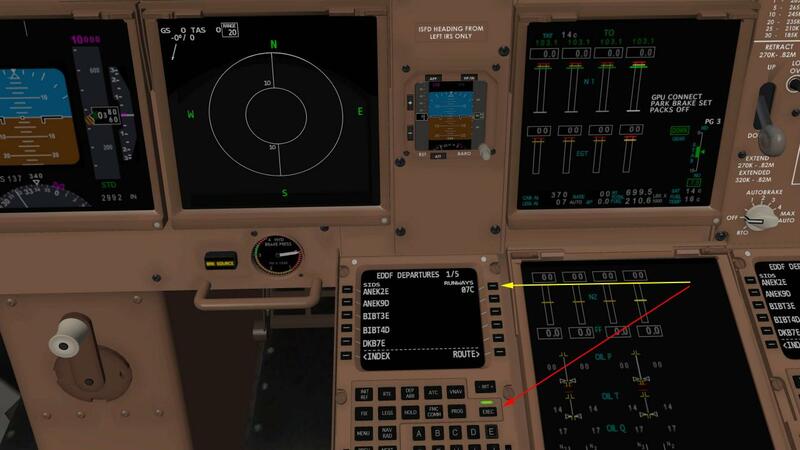 One Lower screen is the "Lower Engine Indication and Crew Alerting System" (EICAS). Overall if you are familiar with most Boeing's cockpits the layout is generally the same with the glareshield Autopilot (A/P) and the pedestal (Control Stand) layout of items and switches. Flip the lid and switch on the Batteries, as nothing will happen until you do this. You now have a choice in starting the APU (Aircraft Power Unit) or the GPU (Ground Power Unit). The GPU is situated on the side screen panel on the pilots left which is known here as the Electronic Flight Bag (EFB). This screen is also your menu system for the aircraft. Besides selecting the GPU, you can also (left side) Hide Yokes, Select Co-Pilot or Pilot flying and zoom position in the 3d cockpit. 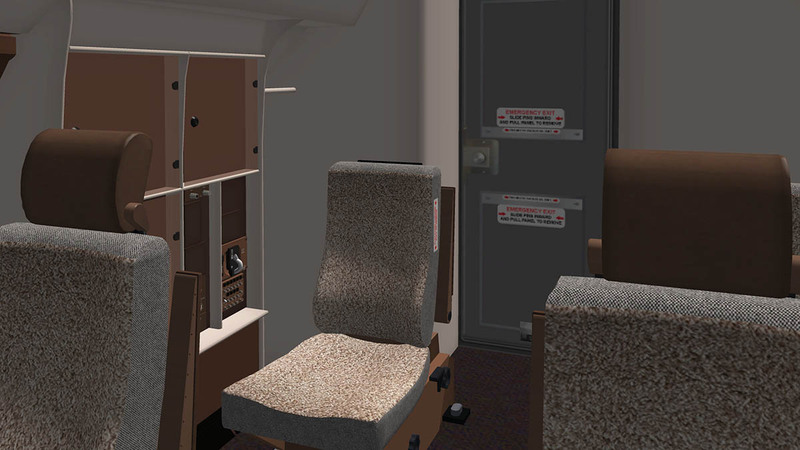 (right side) you can select GPU, Open Cargo doors and Cabin doors. Opening the cabin doors and or with the cargo doors is opening all of them, you can also use the F1/F2 sliders, but I would prefer a more controlled way of which doors to open. Another function of the screen is with a clock (insert) which is very good on long flights. Once the GPU is operating then press on the EXT Power buttons on the overhead panel. You get no Ground Power Cart outside the aircraft which is bit of a shame, as they are usually de rigueur today. Once power is complete the aircraft is ready for setting up for flight with fuel and the programming of the route and flying preferences with the FMS (Flight Management System). 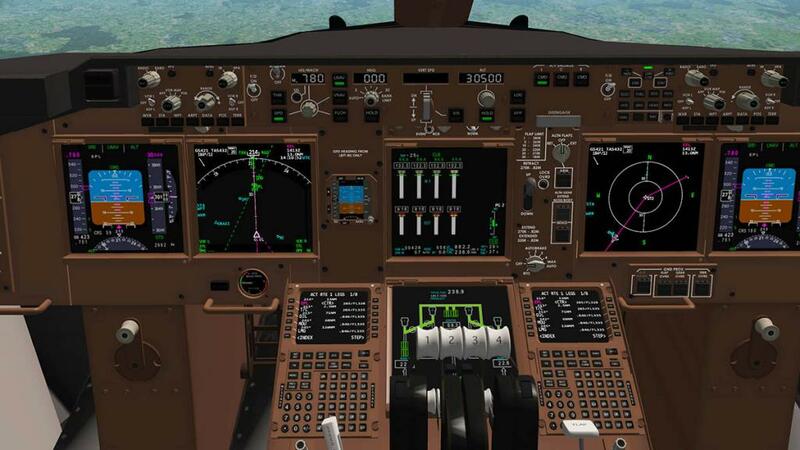 The main feature on the SSG Boeing 748i is the FMS (Flight Management System). This version comes from Javier Cortés UFMC known as the FJCC and is more associated with the x737and as an add-on FMs to other aircraft. 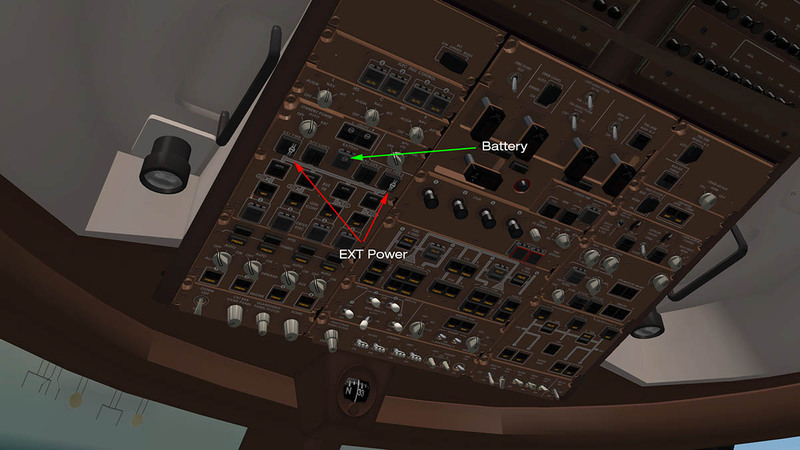 The difference here is that this has been totally integrated directly into the B748i systems and into the Control Display Unit (CDU). I would like to note that this is a review. But the programming of the FMS is worthy of a section in the review because it does show the full set of actions and in one full procedure it is really needed to be shown on how it works. And two there are some slight and very noticeable differences in programming the unit that is really needed to be understood to get the best out of the B748i. The set of procedures are in hindsight are really quite simple. Can in reality if not followed correctly in sequence can leave you a raving idiot. One wrong selection will mean the route is hard to program and the insertion of the DEP/ARR runways can not be inserted (or seen). On start up you have a blank screen with only MENU and "FMS" LK1 (Left Key 1) press this to start. This shows the IDENT of the aircraft including the Type and Air Navigation data in the system. RK6 is your next step key to the next step in the programming procedure and here it shows "POS INIT" (arrowed). 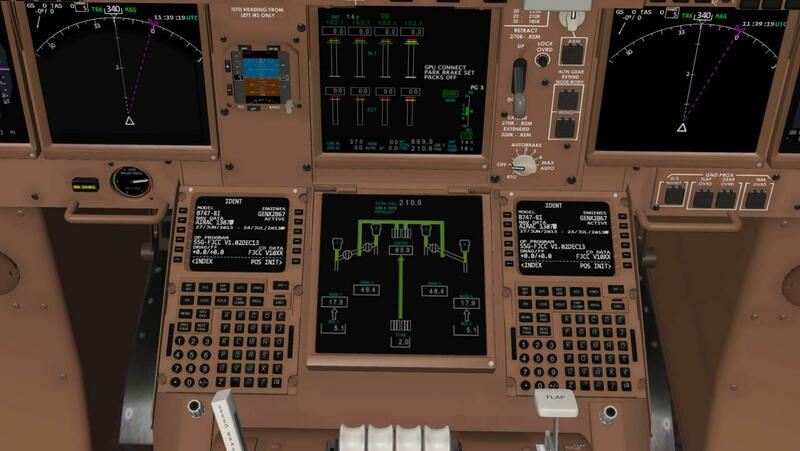 POS INIT - Here you insert in the lower scratchbox your departure airport (EDDF) LK2 to set the location for the FMS (It uses the standard Xplane position co-ordinates) then select ROUTE RK6. ON the RTE 1 page you insert your Arrival airport KMIA RK1. When done you need to ACTIVATE the route by pressing RK6. Then when the green light is lit then press EXEC (Execute). The first thing to understand on this FMC is that in most FMC's is that that when you "Execute" the route it is usually when the whole route and prefs (preferences) are completely inserted. 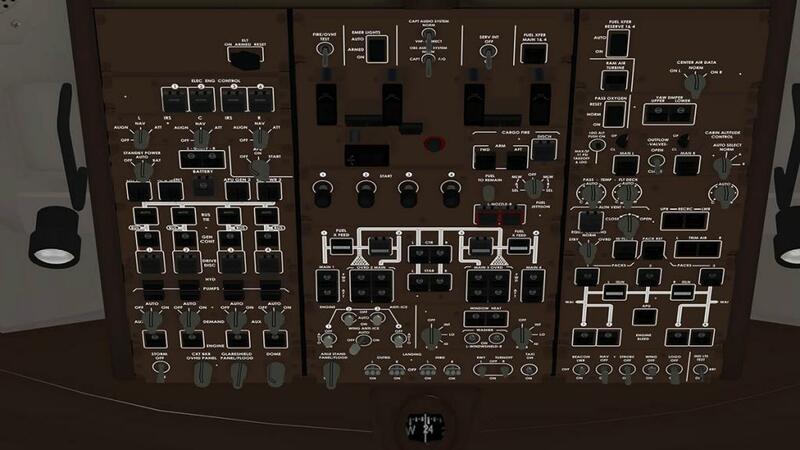 Here the EXEC is really an insert button and you press it to set certain conditions as you plan the FMC. Javier has noted that the system will be later changed to other style of system. Then you can just fill in the route fixes (waypoints) via the RTE key or by pressing ROUTE RK6. The system is very flexible in that it accepts almost all fixes in VOR, NDB's, Air Routes, Atlantic and Pacific tracks, numbered and standard fixes. Just input down the page via the right keys and then move forward to another page when listed to the bottom of that full page. Switch the MAP view to PLN (on the Glareshield). And the route should appear as you input the data. If you want to check the whole route then select the LEGS button and you can use the STEP RK6 key to go down the route that is noted by the . At anytime you can switch between RTE Page and the LEGS page to insert the flightplan. The tricky part is connecting up the last fix (ZILBI) to the runway (ILS 27) which is displayed. You should be able to just input the runway here but it doesn't work. So easiest solution is to use a TRANS on the ARR runway to do the connection. So go back to your ARR runway in the DEP/ARR page and again select ILS 27, only this time also select the TRANS (HENDN) and EXEC. You get the route connected, but there is also a mess connected with it as your route goes off the MAP display. In the LEGS page you will see and then need to do a - ROUTE DISCONTINUITY - to join them up. To do this just type in the next fix over the -ROUTE DISCONTINUITY- which in this case is SARCO and log it into the five box area noted as "THEN". When done then press EXEC to input the change. You will then notice the same route is displayed in White and dotted? This is the MOD or modified route and you have the choice to either select it by doing another EXEC or not. In most cases the flightplan should be complete unless you have to do a few more ROUTE DISCONTINUITY's to clean it up. Care in selecting the last fix to match the TRANS can make your plan perfect. A final note is the racehorse track at the end of the plan is for a missed approach and a hold position. Three items to note: 1) make sure the Flightlevel is inserted in the PREF page that can be accessed by the LK6 INDEX. Failure to note the Flightlevel will mess up your flightplan by adding in the TOC (Top of Climb) and TOD (Top of Decsent) at the wrong points and it changes the flightplan by making it unreliable. (flickers in and out?). 2) Second if you want to restart or clear the flightplan at any time then press INITIAILIZE. 3) Cost index can interfere in the VNAV and ALT predictions, Most CI is listed as about or between 070 > 090. Other prefs (preferences) including more preferences and Thrust Limits, Takeoff and Approach prefs can also be done via the INDEX page. Adding in a SID or STAR from the start of a flightplan is besides adding in the runway (Right KEY(s)), you also add in the SID on the left keys and the TRANS below on the ARR/DEP page. Then find the next best fix to start your route from the SID on the RTE page. On the STAR it is usually slightly more messy. You do the same in selecting the runway (Right KEY(s)) and then select your STAR and TRANS (It will note as the selected TRANS). But when it appears in the LEGS page it might be a bit of a mess with (sometimes many) -ROUTE DISCONTINUITY- 's that will be needed to be cleared up to get a clean plan. Again care is needed to join up the last fix to the first STAR fix so it is clear connection. After few routes and it becomes all very easy to do. But there are a few bugs ( is one that happens to appear more than once in the LEGS page) in the system that will be fixed. Engine start up is mostly automatic. Just don't forget to set the cabin pressure after switching off the APU bleed (Outflow Valves, Open). 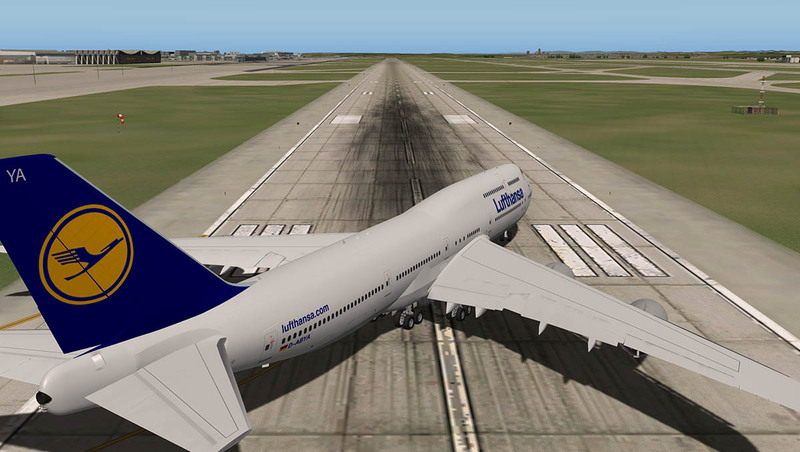 After pushback flaps were set to 10º. 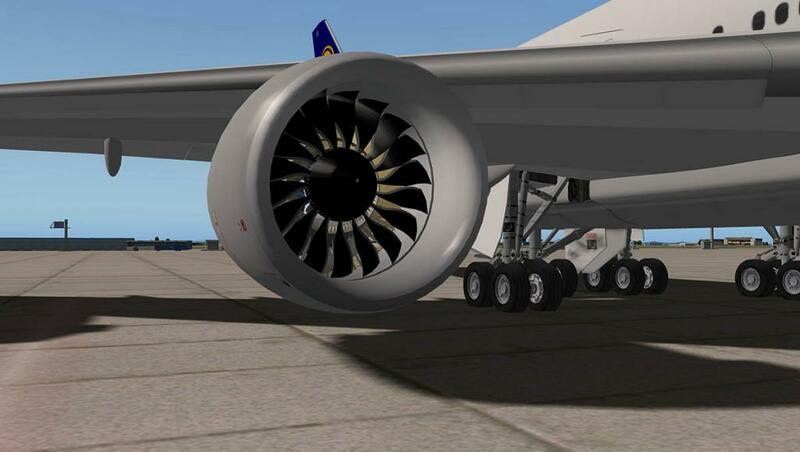 and you will need a very heavy shove of the throttles to get the heavy aircraft moving at 421,000lbs of weight. Taxiing is limited to 9knts on the turns (the steering won't allow more). 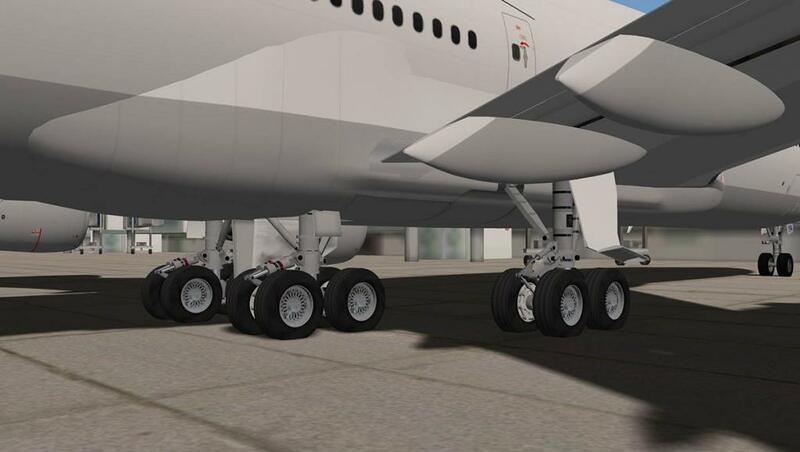 But taxiing is very good, but watch that huge size on turns You are very high up at 28 feet 5 inches (8.66meters) and very far forward (97 feet 4 inches (29.6 meters) from the nosegear) on the main bogie wheels - This is a very big aircraft. Power up and your rolling, but very slow at first. The FMC will calculate the correct V-speeds. At rotate she comes nicely off the runaway at 212knts and if you have the Autothrust (armed) and the LNAV selected, then when ready just select the Autopilot (A/P) and the transition to the A/P system is very smooth and controlled. As the flightplan requires an almost 180º turn almost immediately to the south, so from the pilots seat the ride was excellent and with a great view across all the windows. 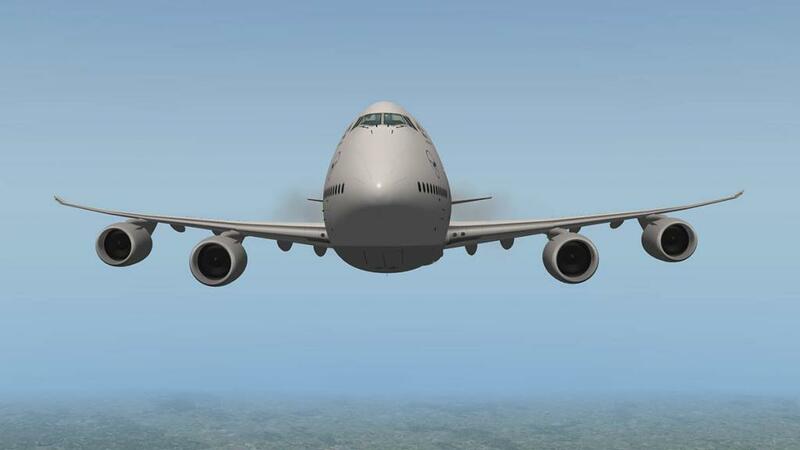 This is what flying heavies is all about, size and weight and big slow movements. Wingflex here is excellent with not too much or too little movement over those huge wings. Recommended "Rates of Climb" (ROC) is Maximum 3,800 feet per minute (FPM) at 250 kts under 10,000ft but I would never go near that. With this weight I used only 1800fpm. other maximums are 2, 200 fpm from 10,000 - 20,000 ft at 280 - 340 kts then 2,000 - 1,500 fpm from 20,000 - 26,000 ft then 1,500 - 400 fpm from 26,000 - 35,000 ft. Again I was far more conservative at 1800fpm to 15,000ft then 1200ft to 30,500ft and then run off the heavy fuel for 500nm before stepping 2000ft at 300fpm until I reached my cruise altitude of 36,500ft. I found the 1200fpm from 15,000ft to 30,500ft started to hit the speed of 300knts (mach) and so I dropping it back to 1000fpm. There are a lot of performance tables in the Manual and you are wise to print them out and study them. They include fuel, weight, Long Range Cruise control and Vref with associated flap settings. The B747 is a very different aircraft empty. Heavy the 747 flies in a slightly ponderous way, but light it climbs like a jet aircraft and the centre of gravity (COG) moves considerably. The Manual is very detailed in getting the best out of the B748i and also shows you the best way to fly the aircraft. You get a lot of alarms and mostly for the "tail stab" fuel tank... If under a certain fuel weight it doesn't fill the tail tank and also for the flaps (while the speed drops to slowly). I've learnt to pick out the important ones out from the annoying ones. At 30,500ft and heading towards m84. the cockpit is a nice place to be. The MAP (pilots) and PLN (CoPilot) on each of the displays, show the route and flight details. 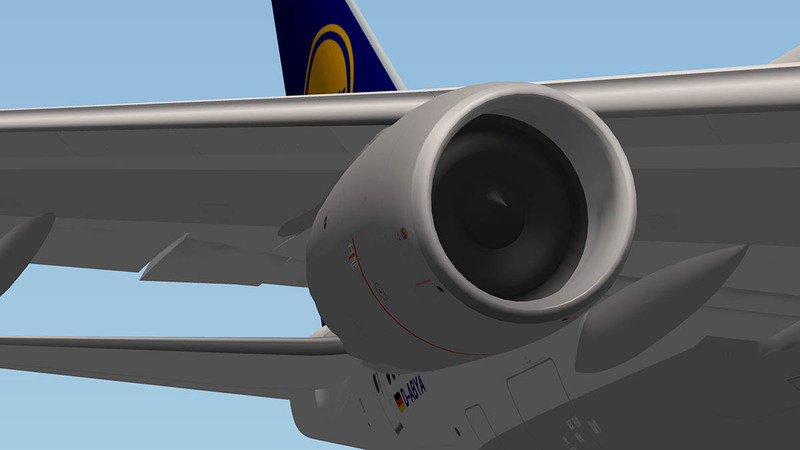 The centre panels (upper) engine and the lower is changeable with other items of details of the aircraft's systems. Covered are ELEC, FUEL, EGS, FCTL, HYD, DRS (doors), GEAR and general INFO. All can be switched over to the Pilots or CoPilots MAP screens and both the MAP and PFD (Primary Flight Display) can be swapped over. 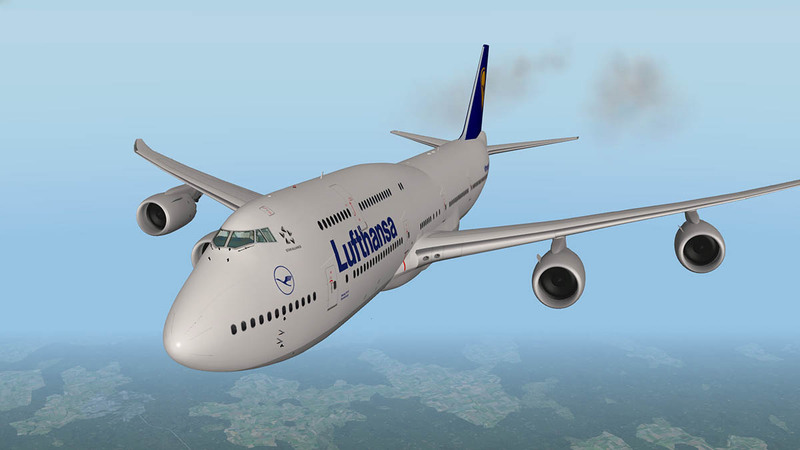 One factor is the frame-rate with the B748i. As noted as an aircraft in Xplane it has a very large presence that can translate to your frame-rate. First is that 1gb of VRAM is recommended, and I really second that. I only have 512gb and I feel the pressure on the system. 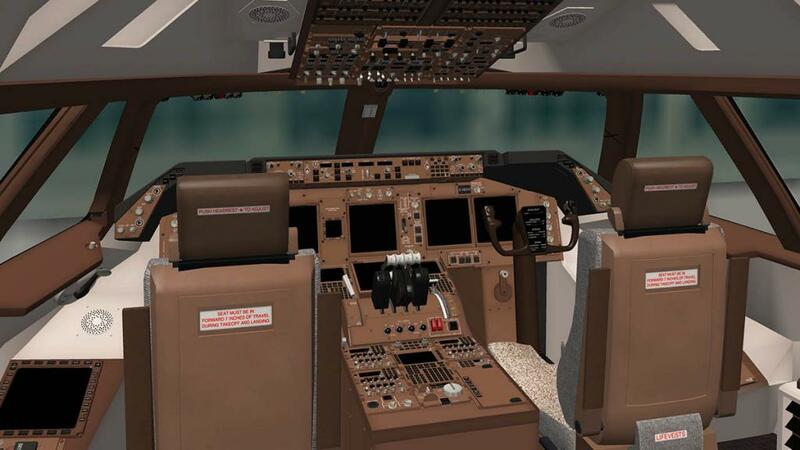 But I can still fly the B758i under my conditions. 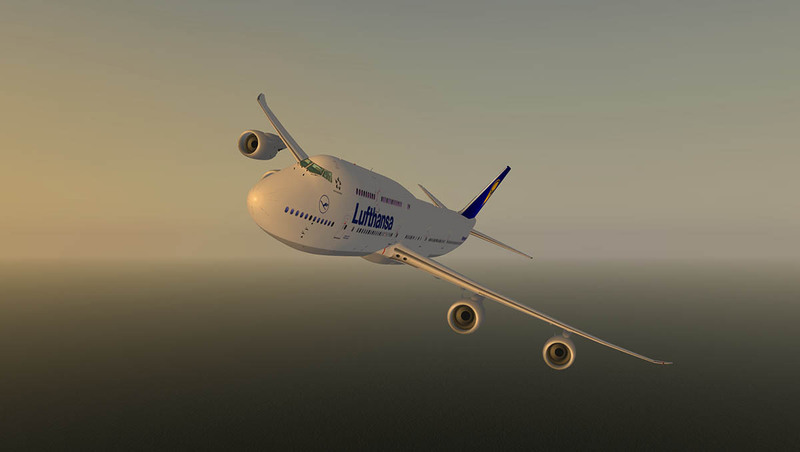 The rules are the same as the Peter Hager's A380, In keeping the render textures low and restricting the "World Detail". The aircraft does have a strange relationship to the Xplane ground textures? In that inside the 3d cockpit the frame-rate can be higher than the outside view. Which is very odd as it is usually the other way around. 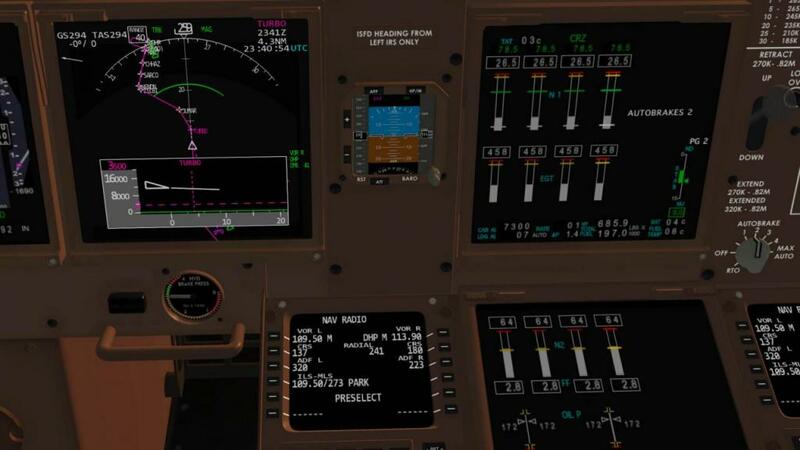 The frame-rate dips up and down more than any aircraft I have ever flown at a high level. (most get a high frame-rate in say at say 50fr then it just usually stays there) but if you can cover the dips in the headroom then you are okay. Sorting out my render settings to accommodate the B748i took a little time, but I have as usual found a sweet spot to enjoy the aircraft - yes there is a tradeoff in texture quality (the aircraft is fine) but otherwise it is very good and well under my 512mb VRAM. 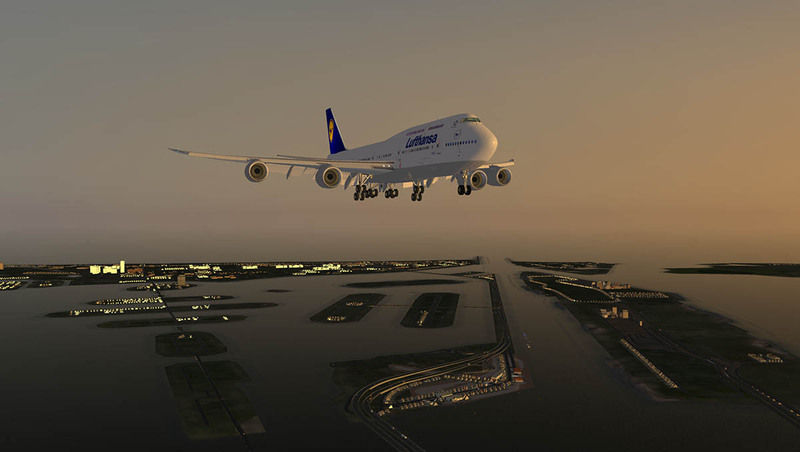 A final note is that you have to also pick your DEP/ARR airports with care, a really big scenery (KLAX or KJFK) will be hard work or not work at all. The cockpit as a work place is well done. 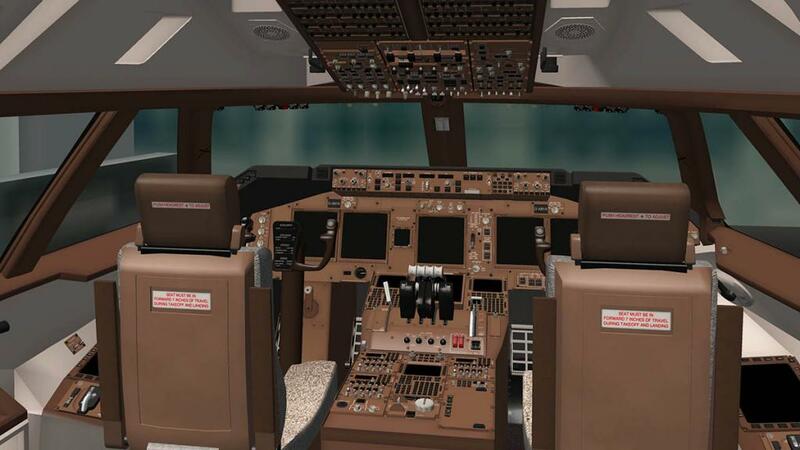 detailing is very good and the main systems are very well modeled of which include... with realistic logic, such systems as the electrical, hydraulic, pneumatic, engine fire extinguishing, fuel (with dumping capability), wing and engine anti-ice, cabin pressure, communications and TCAS. At night the aircraft has a slight white glow, but otherwise the lighting is good. 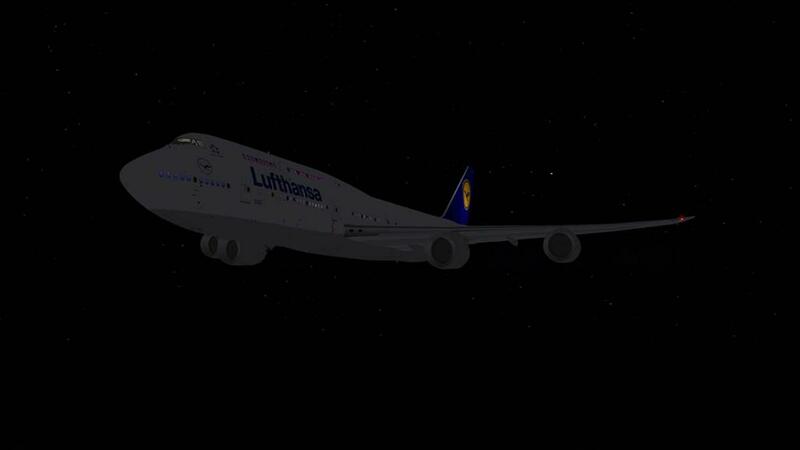 I like the different lighting to show the separate classes within the aircraft and the windows look nice at night. In the cockpit it is very nice place to be, and I really like the strip-lighting under the glaresheild. All panel lettering and detail is very good and adjustable is all the separate panel displays and the dome lighting. Arrival over the Grand Bahama was noted as "not much light left". The huge Boeing looked wonderful in the soft light that showed off the SSG's excellent work. Work on the flight deck sorted the aircraft out for landing and after 10hours flying I was tired but ready for the approach and landing. 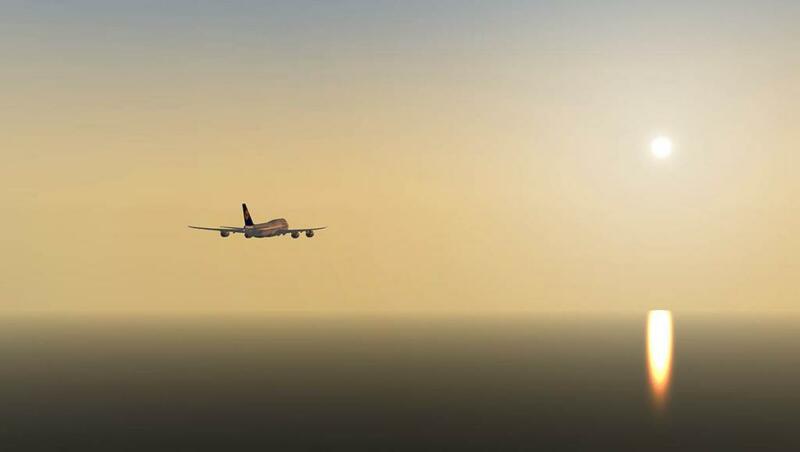 The descent had been set at "No idle" which was good as I was now holding minimum fuel after a 15knt - 22knt headwind almost all the way over the Atlantic. 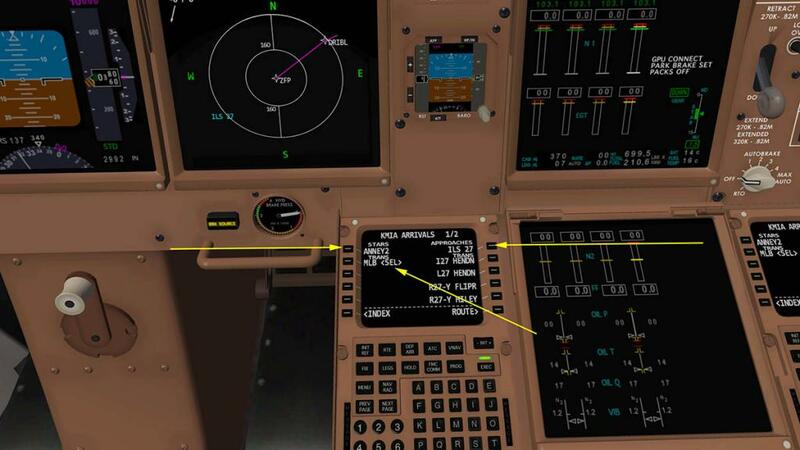 There is the feature of the Vertical Situation Display (VSD) on the Navigation display. A MAP display is in the horizontal plane. Here the VSD gives you the vertical view of your height and relativity to fixs and angle to your Vertical speed. It is a very good tool but it does take a large portion of the lower navigation display. Note the Radio page. The ILS freq is noted in "Park" but I still had to insert the ILS RWY 27 frequency in the VOR1(L) (LK1). As per the TRANS (HENDN) it was my final turn to MIA's RWY 27. 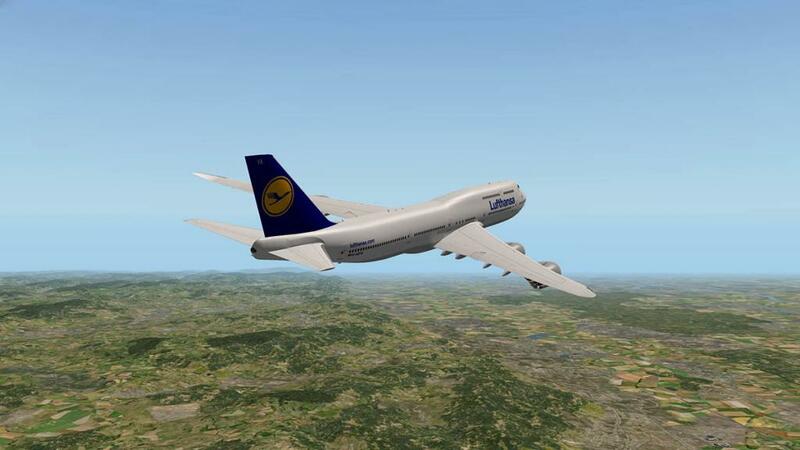 I like to keep my heavies low on approach and more so in the B748i. My height was 1700ft and my speed was still lowering to 165knt. I keep my height low as a trick in that with the weight it won't build up momentum on the glideslope. 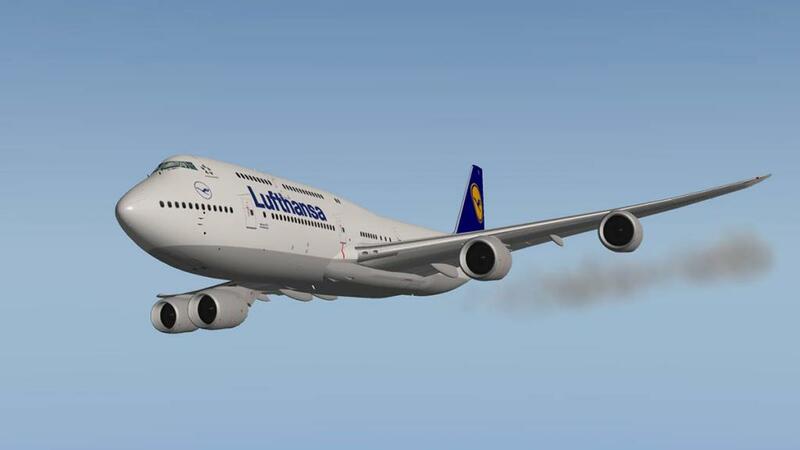 This can keep the speed in check as the B748i is aircraft is a fast lander and you need plenty of space to slow it down. In the sinking light the hanging outer bogies look fabulous waiting to touch the ground. On landing the weight keeps you firm on the tarmac. but still it takes ages to rub off the speed and you run the reverse-thrust long. The full nose steering does not come back until you are in the low 12knts - 10kts range. 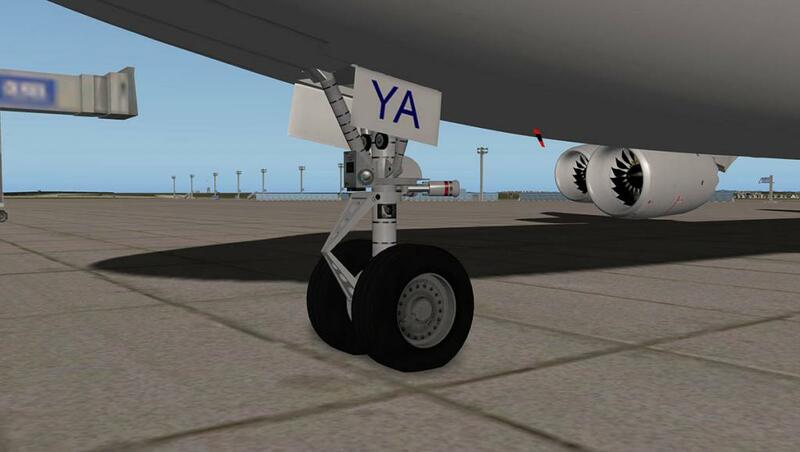 Cleaning up the aircraft and noting the weights and fuel is done on the long taxi to J Terminal. 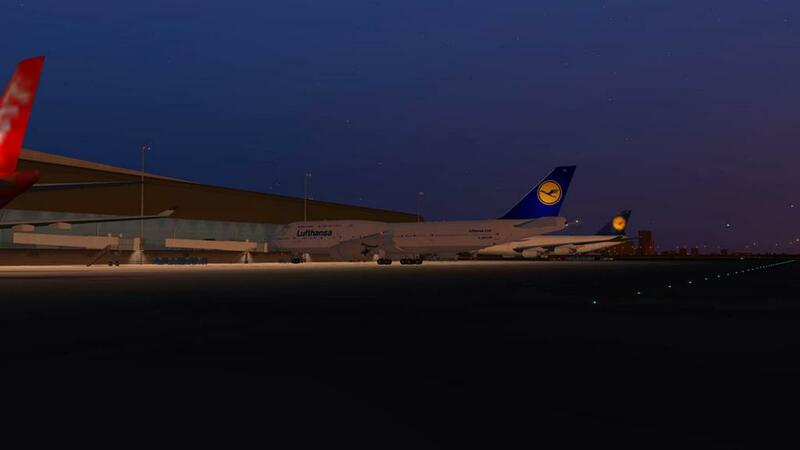 It is a nice cool night here in Miami and soon the big aircraft is parked tightly at the terminal. 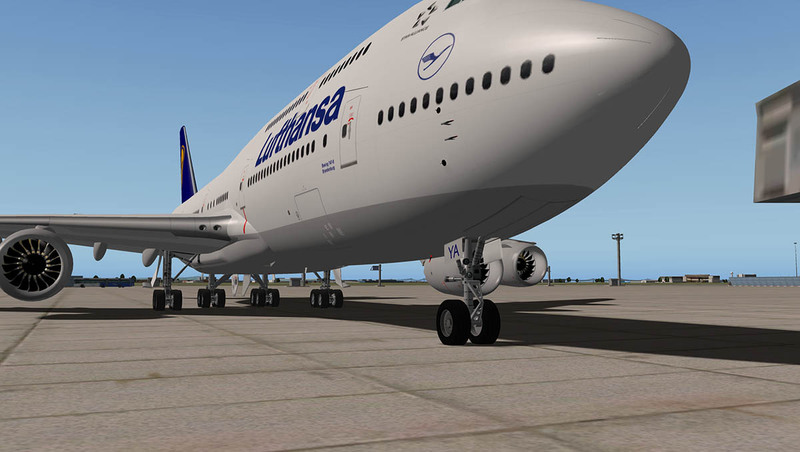 Creating aircraft like the Boeing 748i in Xplane at this level is a Herculean task. Even with a large team as the SSG is there is still many areas that have to be covered. This was brought to light lately by the quiet cancellation of the XPJets Boeing 777. A few years ago this was once the most anticipated aircraft in the simulator. 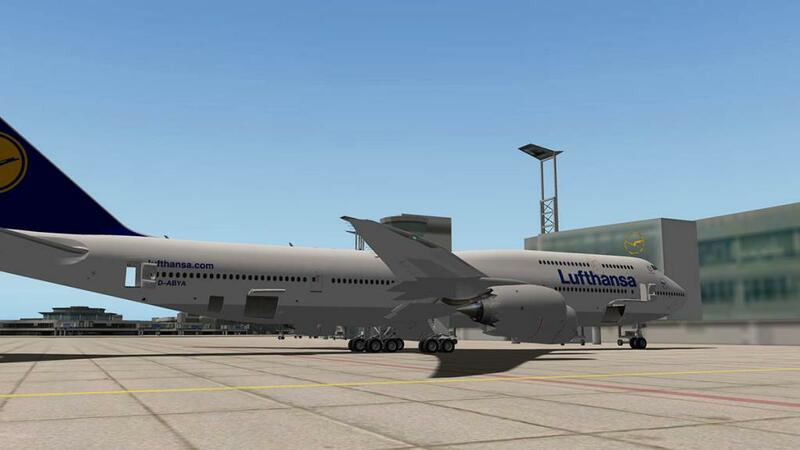 But the developers (some of the very best from past Xplane experience). didn't keep up with the huge natural change and the sheer amount of new features and scale now required to deliver aircraft in this category. So no doubt the B748i is a hugely ambitious project for the SSG team and the release was certainly a worthy goal succeeded. To understand the B748i is to what you don't see on the surface but in how it delivers. The FJCC from Javier is the central aspect of the aircraft. This standard of FMC's are now a certain requirement in this class of aircraft. But aircraft in this class are complex beasts. On the surface everything is simplified for ease of use like in the real world operations. But under the FMC is a complex web of systems that needed to be set correctly and preferences that are inputted into the FMC are needed get the very best performance out of the aircraft. Your notes and details in route, weights, fuel, wind and takeoff/landing performance can all have a significant bearing on the way the aircraft performs behind the scenes. 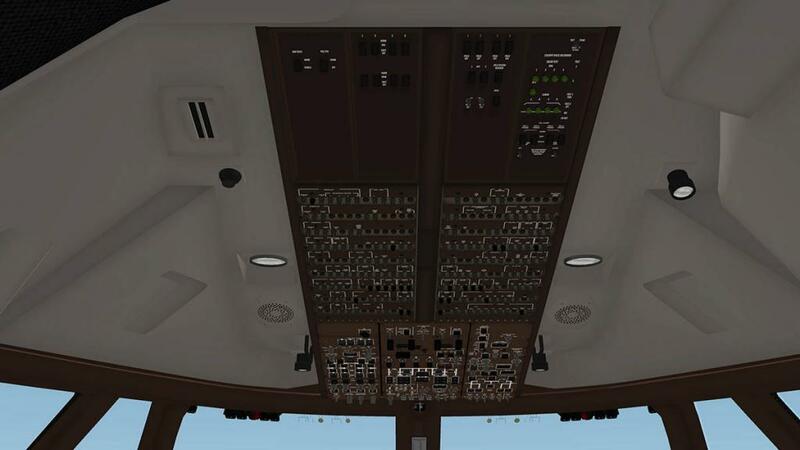 So central to getting the best out of the B748i is understanding the FMC right down to every setting and detail. We look for features we can see and touch. But this is simulation and this is really what real simulation is all about. But a few special effect features would have been nice. The missing GPU cart for instance, checklists, working wipers and rain effects are always welcome. I would have liked the doors to be more flexible in their operation and some slightly more detail around the cockpit. (the panel and operations is fine). All will come in time no doubt. 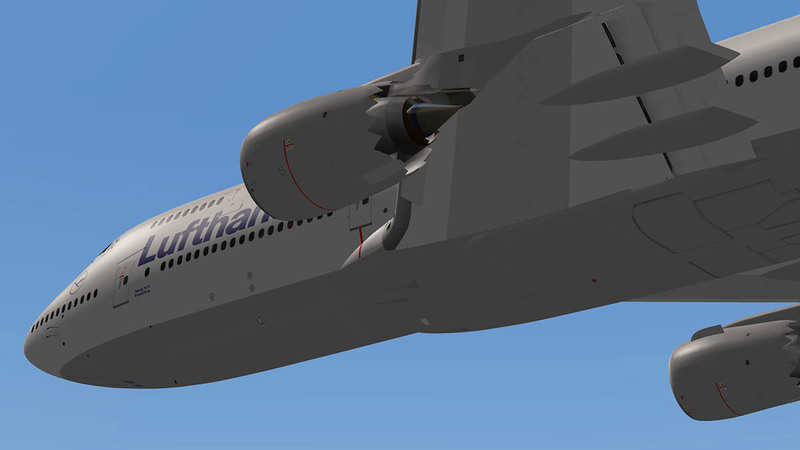 Fine tuning of your render settings is an art and here if you don't have the inserted cards of tons of VRAM and the speed to run a small town, the B748i can run your system hard. As noted 1g of VRAM is the basic safe requirement. 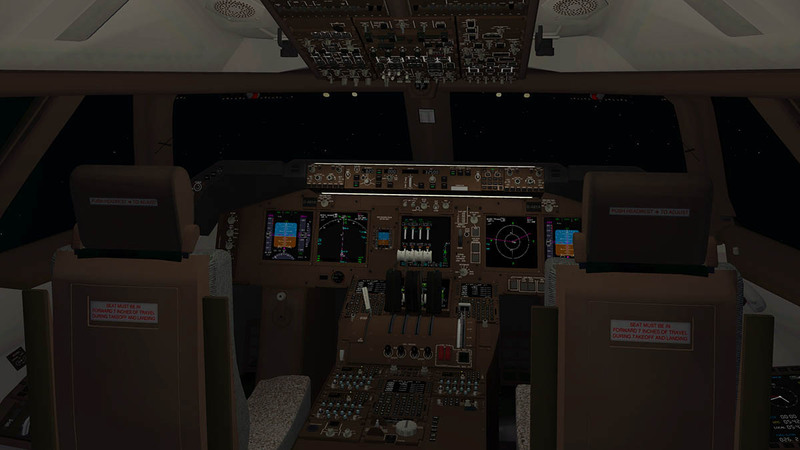 But I ran the B748i well with getting my settings just right with 512mb easily (Just make sure you get as much headroom as you can above the 20fr limit to allow for the yo,yo framerate). So it can be done. In many respects the B748i is very, very similar to Peter Hager's A380 in settings and the use large complex sceneries are out however with this memory restriction. 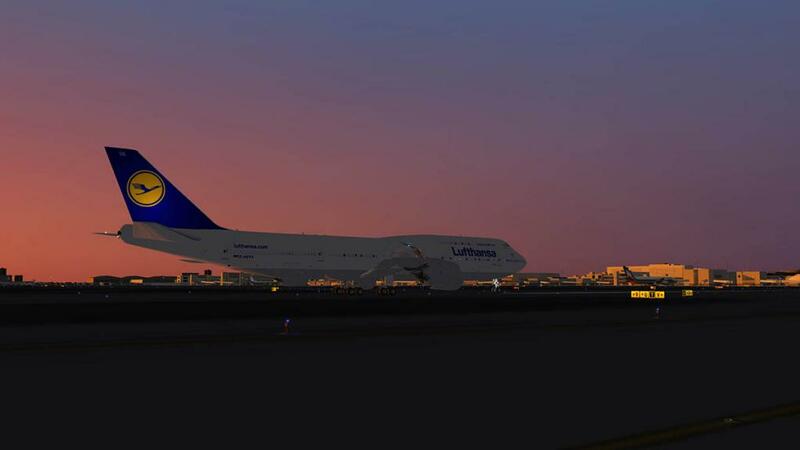 (I haven't tested yet SFO by Tom Curtis and I have had no problems with the A380 there). 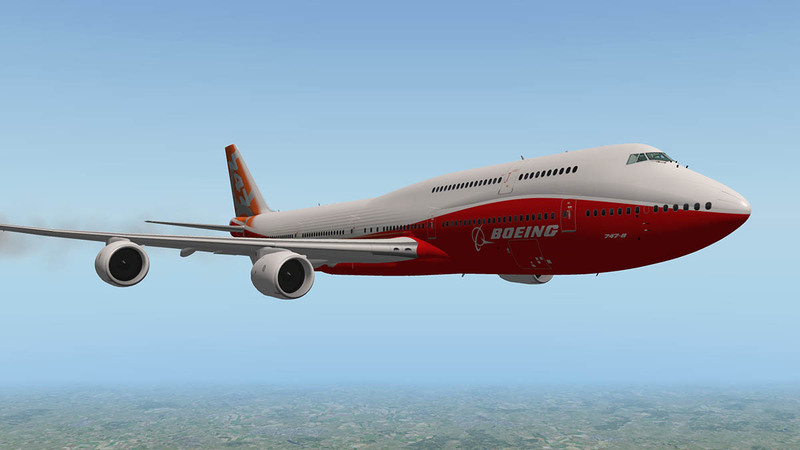 The more time i spent on the Boeing 748i from SSG, the far better it became. 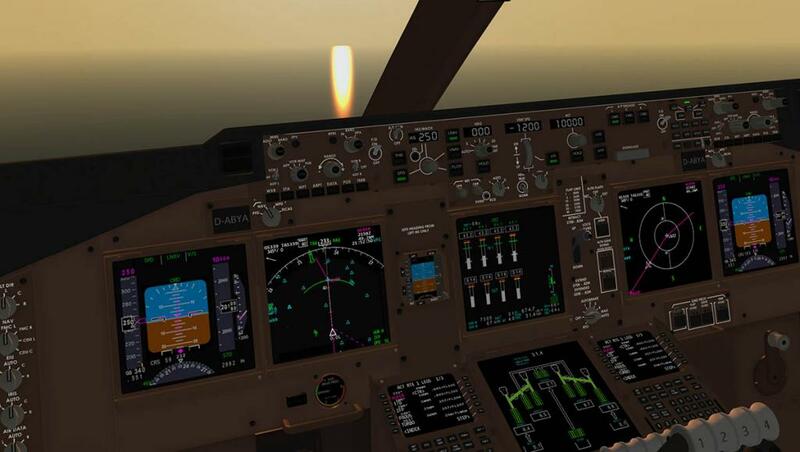 Certainly in tuning the settings in both the render settings and the FMC routing and preferences, this then in turn this brought the aircraft a better and better performance in Xplane. As a heavy jet its performance is first rate. So this is a deep and challenging aircraft in most respects. 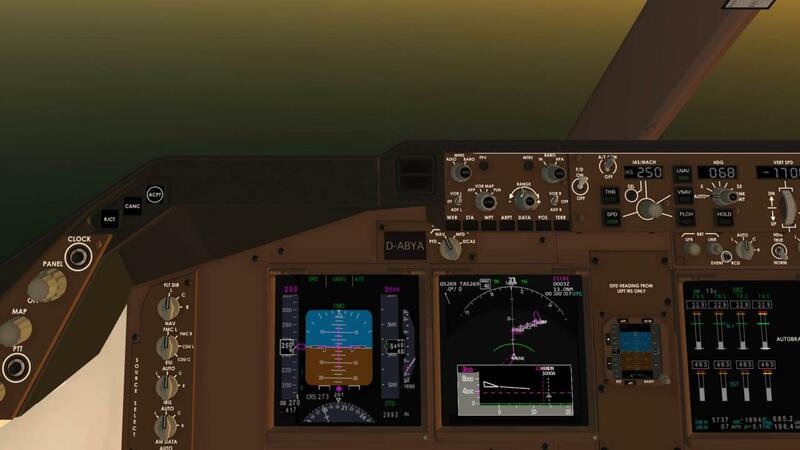 The addition of a separate Freighter (F) version and new cockpit textures will move the aircraft even more forward and I expect it to become a standard Xplane stablemate (with the freighter version) well into the future. 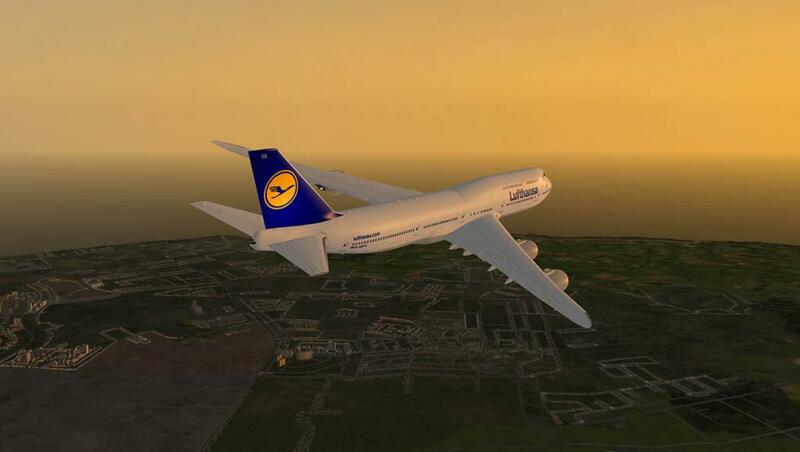 In the mean time it is a great aircraft to fly now. Download is 166.50mb (expanding to 372.50mb on disk). just drop into your Aircraft folder and activation (key) is required. Disappointing! I have the 777 and 757 and they are both excellent representations both visually and technically. 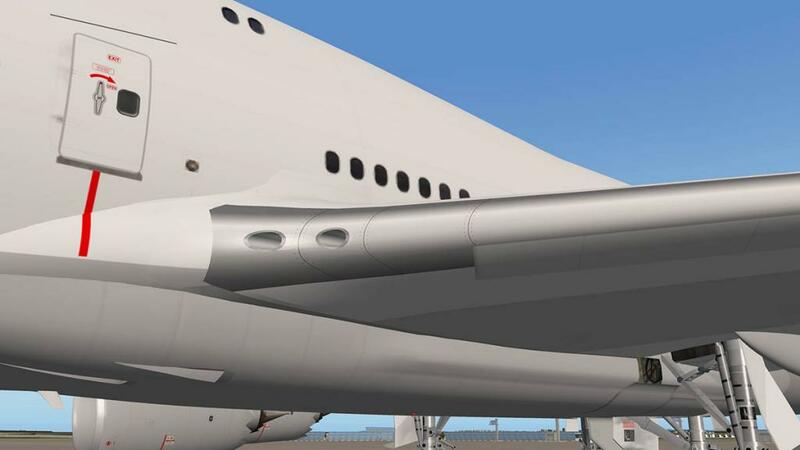 This 747 has a glitch in the upper deck exit door that has black lines going through it at certain angles the cockpit is at a level not suitable for general sale at $60!! 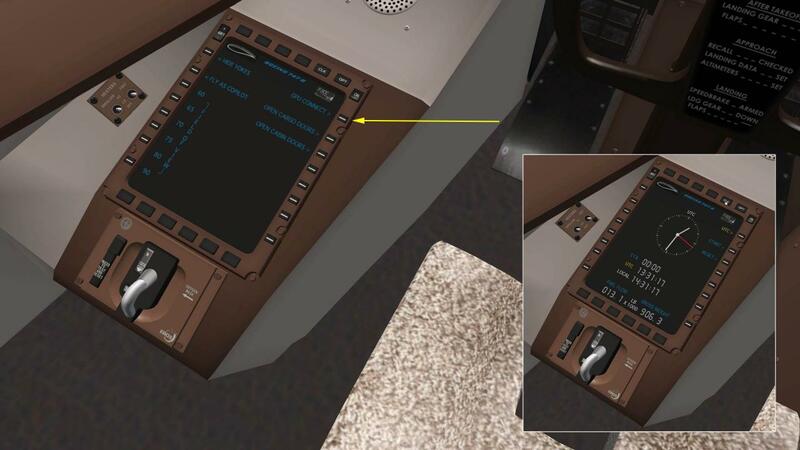 Some textures overlap the writing on switches and the detail level is no where near the quality of the 777, having spent this amount of money I feel ripped off by VMAX as the quality is more of a beta then a public release. Very disappointing and needing updates to fix the poor quality. 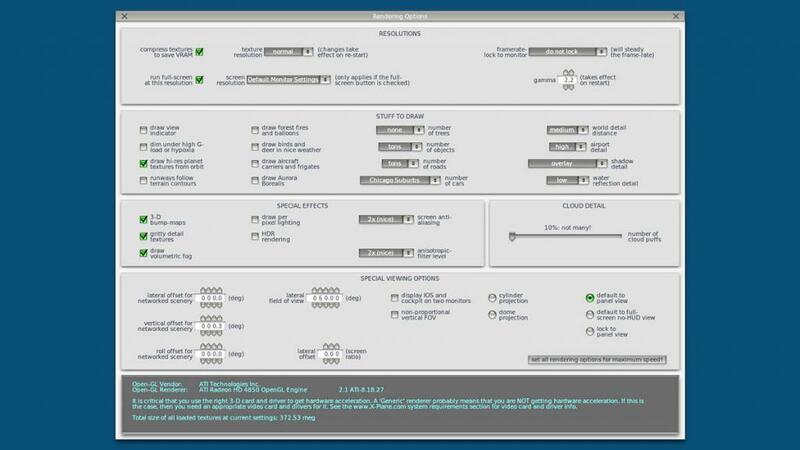 I expected more from VMAX!! I'm running a perfect score (7.9) windows 7 system before people think my system is in adequate. Hi , the SSG will be very OK to give your money refund and cancel your serial. Then may you will not feel ripped by Vmax or SSG. Although is not all people thinks like you as almost only makes criticisms. here is a forum that people thinks different around the SSG B748. So the reader can have the other side. As has just been demonstrated, SSG is a class act. I did not run the review at the release of the SSG 748i as there was a few points that did not come up to the level of quality that was expected in this class. However the upgrades were good and very efficient from SSG and the next upgrade will address most of the smaller problems, remember this is normal in complex designs in simulators of this level, as even the FF Boeing 757 was also pulled at the last minute and was then not released for another 3 months! It is also more a much more deeper aircraft than what is shown on the surface. As noted in the review the more time on the aircraft then the more interesting it becomes. That extra time in spending on the B748i between the release and the review was significant on understanding it correctly. A review at the release point would have been very different to the one that was posted. It will be very interesting to recap in a few more months as the SSG team kill a few of the final bugs and add in a few new features. Even now I find it a very interesting machine and will be following the design with interest as it progresses. I detect some sarcasm on your part but I am not sure what else you would like us to do - Ricardo offered you a refund because you were unhappy. We have noted your complaints (I noticed the line on the UD door too, but did not feel it warranted holding up the release) there are lists of items we plan to address, some big, some small. Also features we want to add and enhancements we want to make to the product. I am sorry you were unhappy with the textures, but we are working on improved cockpit textures and many other things. We are not chasing any other X-Plane development team or comparing ourselves to them. We have been making aircraft for a while and we choose to emphasize certain things over others as a team. It seems you prefer another team's approach and that is fine. So you tried the product, did not like it and now you can get a refund - no questions asked. That seems fair and "classy" to me. Hi guys, keep looking into the last releases, buy the planes, all planes to keep the teams growing , keep talking about us, it make us more popular , "Bad or Good" doesno't matter the important is keep talking. We aways will show our defence and apologises for our product. Would you do the same ? Show the 2 sides , the good and the bad. Yes we read the goodies and the badlys, some we will adress to the project , some not because isnot the project target. New liveries , cockpit looking "Skins" will be available to download, new updates will come, we only release the SP1. And it will have the SP2, to kill the related bugs that still in. Don't think the B777 or B57 or 320 Neo or Peter or any otter complex XP aircraft came from any bug "bug free". I never saw and beliave a have got all planes. But all was or will be solved as aways did. 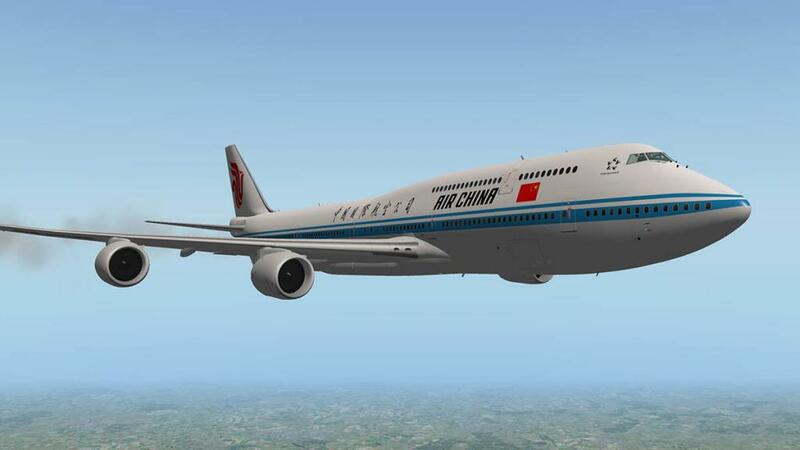 I think the most important is that X-plane right now have the "King" as a complete and complex aircraft model. And the XP commutity that earns more with this fact. I apologize if you interpreted my remark as sarcastic. It was absolutely not. I meant it in the most respectful and positive manner. Also, you are confusing me with the individual that was unhappy with the product. I am not SJ Prior. No - it is I who must apologize. It is hard to tell in emails and texts the tone of a person's voice. All comments and suggestions are welcome as long as they are respectful and stated in a positive manner, as you say. User comments definitely help us and can shape the direction of improvements and changes for the product so I sincerely hope my comment did not discourage you or anyone else from sharing them with us. SSG, please make a video tutorial on how to use the FMC. I don't know how to do the SIDS/STARS and some other parts. Plus I don't know how to, once the fmc is set up, how to use the autopilot to follow the route! Other wise it's a great plane but without the knowledge of the fmc, I can't use this plane! Hi all. Eventually, I will buy the 748i. I've flown the beta(?) that was free at the org site and find it very satisfying. I like it. As far as spending 60 bucks on this updated release, I choose to wait until the bugs are ironed out. I like, or should I say, I LOVE all designers, they are artists and all have somethig to offer. I do respect that. Of course this art is subject to technical besides presentation. I listened/watched the 30 minute intro presentation, and in all due respect, I found the presenter very boring (tho informative). He didnt add excitement to the product. I must admit, I've done presentations/VO's/theater as well as train people to do such, (my artistic side ...) so I may be a little harder than the regular consumer. But in Fact, excitement does sell! Half of all sales are made because the consumer liked the person selling the product despite any negative they may have. I'll be watching..waiting. I will buy this plane! Maybe tonite, maybe tomorrow...who knows?? As for the dissatisfyed customer, well buyers remorse can bug the heck outta ya, but from what I can tell, these artisits are serious about their work and are hell bent on improvement and perfection. Look at it as an investment. If my wallet was full, I'd invest NOW! I love the plane, but I don't know why my cockpit turns black before I attain my cruise level? What am I doing wrong? EDIT - All my problems have been fixed by SSG, Navigraph installed incorrectly and I was using a wrong cost index. EDIT - All problems have been fixed. This news makes me happy, even if in the meantime I bought another Airbus instead of this. Maybe it will be for next time. Maybe concurrently update graph of the cockpit. (Hopefully there is). However: Nice guys. Continue to develop your products to keep pace with the times, never give up, so we'll all be happy and you sell more. Just out of curiosity, does this plane happen to include a 3D cabin? Of course, this doesn't usually make or break a deal when I'm buying planes, but it'd be nice to know.